Should bicycle logos in bus lanes be larger? COMMENT & ANALYSIS: Painting bicycle logos in bus lanes — while not a long-term solution — might be a good idea to highlight that bicycles belong and people using them don’t need to cycle too close to the kerb. But should these bicycle logos be larger than the normal cycle lane bicycle logos? Should the bicycle logos be as large as the ones in National Cycle Manual? Or does it matter? IMAGES: Main photo by IrishCycle.com; tweet images by Dublin City Council; and National Cycle Manual graphics by the NTA. Of course they should be bigger., I sometimes feel like I am an unwanted visitor in the bus lane. Making the cycle symbol at least the same size as the “bus lane” will give both confidence to cyclists and also clearly state that bikes belong there and not just at the edge. I cycle in Brussels. The size is not important. What is very important is that they are in the middle of the lane and not the left. I cycle in bus lanes everyday in Brussels. What’s important is for everyone to know that the lane, the whole lane and all the lane is yours. Taxis are buses are not allowed to overtake without using the next lane. If the lane is too wide buses and taxis will try to pass. So don’t fight for wider bus lanes. Its not going to work. Its either wide enough to take a separate bus lane or it’s not. Done as per NCM please and with a good repeat frequency. Taxi drivers who undergo no annual CPC (RSA) have to understand that at some times cyclists will control a narrow bus lane. 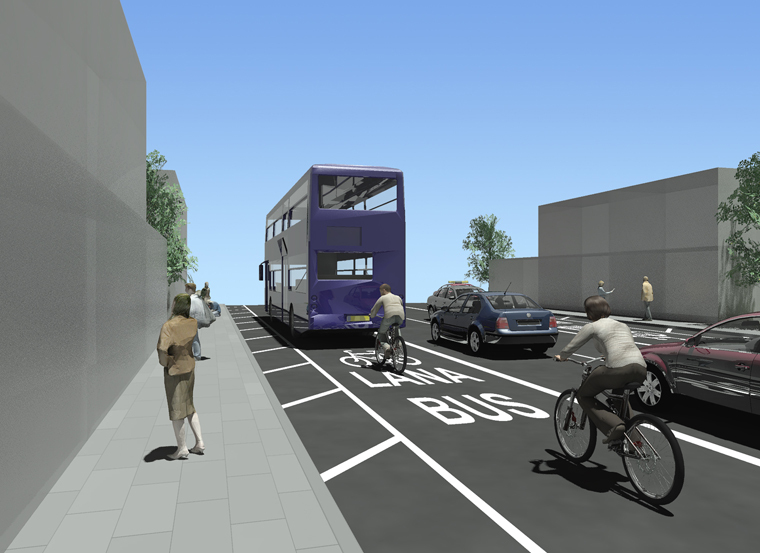 We all know already that bikes and bus lanes shouldn’t be mixed. It’s f-ing ridiculous. I’ve heard from people who use the bus complain bitterly about someone on a bike blocking the whole ‘bus-lane’ and thus preventing a bus-load of people getting to work. And I have a lot of sympathy for that view. It does look bonkers when a bus packed with people is being ‘held-up’ by a single bike. And in those cases, the anger and frustration of people on the bus is directed at the person on the bike, and not all the bloody motorists taking up the 2 lanes to the right, or the incompetent planners that decided to make bikes share space with buses in the first place. This misdirected anger and frustration does nothing for the cause of improving cycle infrastructure because those same frustrated people on the bus will come to regard bikes as a nuisance, not worthy of money and space. So, do we need bigger bike-logos? I don’t know, because I really don’t think we should be advocating the mixing of these two forms of transport. We know no such thing. Try not to let your segregation only attitude blind you. Perhaps they should be bigger, but I don’t consider that a big deal. They absolutely should be present on bus lanes like the one along the N11 where there is a cycle lane alongside to remind vigilante bus drivers that bicycles ARE allowed there. Pardon? Segregation only attitude? I think it’s a bad idea to mix buses and bikes. It’s dangerous for those on bikes. And for those that are less confident it’s disenabling, because they just won’t cycle if they perceive the journey as too dangerous. It’s ‘fine’ (with multiple caveats) for someone like me who’s confident on bike, but it’s totally disastrous from the perspective of trying to enable more people to get out of cars and cycle. And as I also mentioned above, mixing the two results in hostility from those not on bikes. Do you think there should be no segregation? Should I characterize you as having a non-segregation only attitude? until the establish and maintain proper Cycle paths then sharing the bus lane is the best and safest option. I use the N11 daily and there are several parts when the road is the safest option. in several places you have a bike lane painted with a broken white line in a bus lane? what purpose is the broken white line serving? as a bus wont fit outside it while staying inside its solid white line. they need to remove all lanes that are trapped inside bus lanes where the two don’t fit and replace then with the one lane. I’m not sure what your point is and how it relates to my contention that mixing buses and bikes is inherently a bad idea. Are you saying that, for the moment, because of the crap or non-existent proper bike lanes that you think mixing buses and bikes is the lesser of two evils?